your dog for a walk. Generally, it’s a short and easily forgettable experience. The Carousel Rest Area of Shelby is changing that. 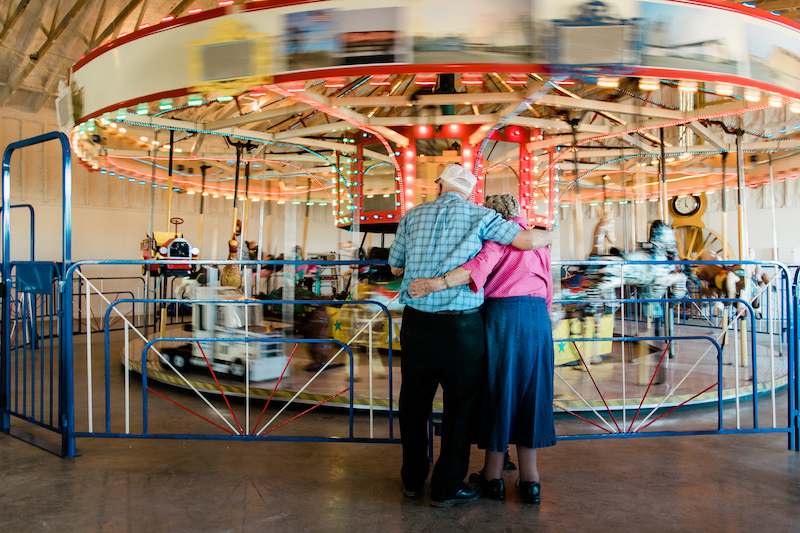 Located just off of US Highway 2, this unique stop features a 1936 New York carousel with 600 lights, music, and over twenty animals to ride. Many of the animals—which include a variety of horses, two roosters, two giraffes, and a monkey—have been repainted by locals, including inmates at Crossroads Corrections. A patriotic-themed horse painted by the inmates is a favorite of Carousel Rest Area founder Harry Benjamin. Benjamin, a retired rancher, was exploring ways to create an inviting rest stop for travelers along US Highway 2 in 2016, around the same time that the 1936 carousel was being hauled through town. It had lost a bearing on its way to the county fair, and Benjamin had helped get it running again. He later bought the carousel for use at the rest area, sinking $85,000 of his own money into the project. Others have chipped in to see it through. The Carousel Rest Area of Shelby had its soft open in September 2017, and as of spring 2018, the interior is nearing completion. What began as an idea for a simple rest stop has grown into an attraction all its own. For some it will offer a break along the road, but for many, it will no doubt be the destination.